I don’t know about you but I think there are the beginnings of a subtle power shift in the European rock/metal scene away from Scandinavia – that let’s face it has been at the forefront of the rock/metal revival since the early noughties – to the sunnier climes of the Mediterranean or more specifically Italy. Sure the Scandinavian scene is as vibrant as ever but it seems that my review pile for virtually every issue of Fireworks contains a release from yet another talented band from the Azzurri. Turin based The Rock Alchemist are no exception. 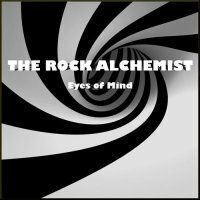 The band have chosen their name well as one of the defining goals of alchemy is “the transmutation of common metals into gold” and that pretty much sums up in one sentence The Rock Alchemist’s approach to their music. At their heart they are undoubtedly a progressive metal band but – no doubt from learning their chops playing in Bon Jovi, Europe and Journey cover bands – they bring a serious arena rock styling and sensibility into everything that they do. Ok it may not be gold that they’ve created but its bloody good none the less! They kick things off with ‘Live Or Die’, a song inspired by the extraordinary life of the late, great F1 World Champion Ayrton Senna. Although this is essentially a guitar driven hard rock song with no discernable chorus the addition of some deft AOR touches and one or two prog flourishes turns it into something rather special. Why not check the song out on You Tube, where it’s set to some vintage Senna footage, to see what I mean. The gentle acoustics of ‘Guardian Angel’ are up next that build into a huge rousing chorus, creating a real arena filling power ballad that also features some fine lead work by guitarist Beppe Geracitano. ‘The Pantheon’ is one of two short instrumentals on the album that starts with some tribal rhythms before giving way to a crunching riff and more exemplary lead playing from Geracitano. A rumbling bass then heralds the arrival of one of my favourite cuts on the record. ‘Shakespeare In Rock’, with its killer riff and incisive melody, will have old school Queensrÿche fans positively salivating and left wondering why Rÿche can’t produce songs of this quality anymore. The band has chosen to include actual prose composed by the Bard himself to make up the lyrics. It may not recreate Will’s famous iambic pentameter rhyming couplets but one thing’s for sure I don’t remember enjoying Shakespeare like this when I was at school! ‘Fly Away’ and to some extent ‘Eyes Of Mind’ head into heavier Symphony X/Dream Theater territory; where staccato riffs, intricate drum patterns and well placed keyboard embellishments serve to showcase the high level of musicianship within the band. They leave the best ‘till last though. ‘Broken Glass’, a smouldering seven minute blues epic, is easily the best song on this rare metal nugget. Fabulous stuff!